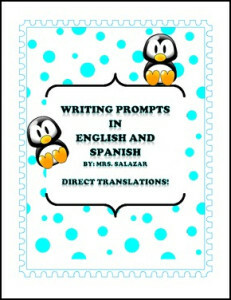 This freebie includes Expository, Narrative, Fiction, Nonfiction writing prompts in English and Spanish translation. It also includes additional writing paper for the composition. This is a great freebie for bilingual students and classrooms. Different genre of writing prompts. Spanish translation is a direct copy of the English composition prompt. I also provided a space for illustrations or drawings for students or they can use it to create a rough draft or outline of their writing sample.